Magnetism- a physical phenomenon produced by the motion of electric charge, resulting in attractive and repulsive forces between objects. Magnets-a piece of iron that has its component atoms so ordered that the material exhibits properties of magnetism, such as attracting other iron-containing objects or aligning itself in an external magnetic field. 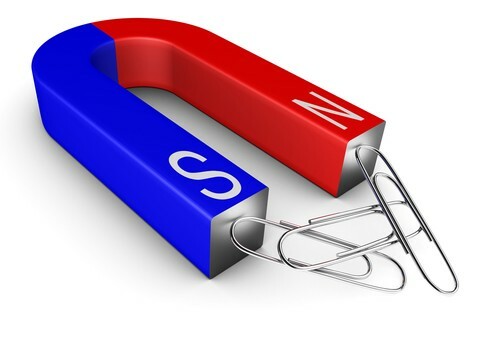 Temporary Magnets-An object that is surrounded by a magnetic field and that has the property, either natural or induced, of attracting iron or steel. Permanent Magnets- A piece of magnetic material that remains its magnetism after it is removed from a magnetic field. Electromagnets-An electromagnet is a type of magnet in which the magnetic field is produced by an electric current. The magnetic field disappears when the current is turned off. Electromagnets usually consist of a large number of closely spaced turns of wire that create the magnetic field. Magnets have north and south poles. When working with magnets you will find that opposites attract but, same poles repel. Did you know that compasses use magnets? Also, a shepherd named Magnes discovered magnets. Jupiter, Saturn, Uranus, Neptune, and Mercury are other planets with magnetic fields. A magnetic field is a chart like the one above that shows electric charge with magnetism acts.